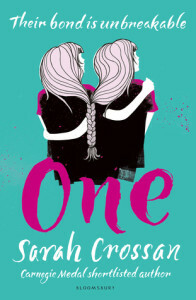 Sarah Crossan is, like Patrick Ness (of whom more in a few weeks), on the Carnegie shortlist for the second year in a row. I wrote a little about that previous shortlisted work here–I enjoyed it, but found it rather lightweight and insufficiently thought through to really consider one of the best children’s books of the year. One is stronger and more interesting merely by virtue of being a novel in verse. The plot, in short: Grace (our narrator) and Tippi are conjoined twins in their teens, about to go to school for the first time as there’s no longer money to educate them at home. Both are dreading the new school; but they befriend classmates Yasmeen and Jon and spend a few relatively normal teenage months (smoking by an old church, falling in love with the one boy in the group) before tragedy strikes. There’s a lot going on in One. Money is a constant concern–the two major life changes that the twins face (going to school, and later allowing a journalist access to their lives) are made out of financial desperation. Their father is unemployed and alcoholic, their mother loses her job part of the way through, their little sister can’t afford her ballet lessons, Jon is at their school on a scholarship. Jon’s mother has abandoned him, Yasmeen has HIV, Dragon (the little sister) is anorexic and to all appearances no adult has noticed yet. If I’m reading this book in a good mood, all of this is a useful reminder that people generally have several things going on at once and have to cope with all of them. Some of it is done well–that Dragon’s anorexia goes unnoticed by the adults in the story while Tippi’s weightloss is a cause for concern is treated with restraint; the two incidents are placed together but not commented on. The One of the title is Grace-and-Tippi, and it’s also Grace herself, as a separate person. A recurring complaint made by Grace is that people tend to see her and Tippi as a single unit rather than two individuals–though the same people also misunderstand the depth of their connection. I was relieved that Crossan didn’t do the dull thing and have the twins both tell the story in alternating viewpoints. (It did mean that when the tragic end loomed the outcome became easier to predict, but it’s not the book’s job to shock you.) Within the text, Grace is the bookish one; in the fine tradition of twins who love each other but are also totally different in temperament–Grace is definitely the Elizabeth to Tippi’s Jessica. That’s probably an unfair comparison (both twins are perfectly reasonable humans, and neither of them reaches anything like the extremes of self-righteousness or sociopathy that the Wakefields achieve), but it’s one I make because it speaks to an aspect of Crossan’s work that I find disappointing. Here, as in Apple and Rain, her characters seem to fit very easily into stereotype, and beyond those broad lines we’re rarely given a sense of fully-realised people. I don’t know much about Grace except that she’s quiet and bookish; I know next to nothing about that bookishness except that it seems to embrace everything that the boy she has a crush on likes (and Who Among Us, to be fair). Presumably she had likes and dislikes before she met Jon; perhaps she’s even told him about them and he too is reading her favourites feverishly? We don’t know, and Crossan never gives us the sense that there’s more to these characters than this. Where things get interesting, to me, is with the introduction of Caroline Henley, a reporter who (or whose employer) pays the family $50,000 for the right to follow the twins around and film them. The possibility of being paid to make a spectacle of themselves is broached relatively early in the book, and it’s always framed as invasive and creepy. Tippi is more strongly against it than Grace (as far as we can tell from inside Grace’s head and outside Tippi’s); Grace seems to view it as a pragmatic choice, noting that lots of people make money from putting themselves on show (her examples are supermodels). Tippi aside, though, all of the other people being outraged by the possibility are being outraged for the twins– their father, for example, rudely asks the reporter if she’ll expect to film the twins in the bathroom. And people always want to know. so sometimes we tell them. And then she does tell us. To stop us from wondering (“it’s all / the / wondering / about our bodies that bothers us”); and the effect is to place the reader in the position of the outsider whose curiosity may be well-meant, whatever that means, but is still invasive, is still prurient. [I'm reminded, unavoidably, of trans writers talking about cis people's preoccupation with the state of their genitalia.] Like the supposed viewers of Caroline’s documentary, we’re being invited into the book at least in part for the purpose of understanding what it is like to be a conjoined twin, what it means to be a conjoined twin, how these two people and their bodies work. Crossan’s author’s note suggests that there’s been a great deal of research involved in the project for her, but it also contains things like “It might be astounding to a singleton, but conjoined twins do not see themselves or their lives as tragedies” and “writing this novel has been a huge honour,” which seem to place it in a very specific tradition of Writing The Other. It’s a tradition that the book is clearly aware of–witness the characters’ initial suspicion of reporters. And yet the book ends with Grace telling her story to that same reporter–Crossan is placing herself and her book in Caroline’s position. None of this, unfortunately, means that One is able or willing to tackle the discomfort inherent in this situation–to face the question of whether the novel’s gaze is inherently exploitative. Caroline is willing not to film the twins constantly, to provide them with contraband snacks in hospital, to cry when things get bad. “I want to be suspicious,” says Grace, but it seems Caroline cares. “She has proven she isn’t the paparazzi / She has proven she won’t take / our lives and turn them / into a sensational story”. The book, then, performs this critical engagement–it dramatises discomfort with its premise, and then has it “proven” benevolent. Tippi and Grace trust Caroline, who are you, the reader, to complain? It raises the spectre of its (and our) spectatorship and then reassures us that we’re fine.